Laying your head down after a long hard day can be blissful. Your first thought probably isn’t about clean your pillow is, but perhaps it should be. The Fine Bedding Company conducted research recently that found that a third of us haven’t bought new bedding in ten years, and a quarter of Brits haven’t washed their duvet. Ever. The chances are that your pillow is full of dust mites, skin cells, sweat, fungus and bacteria, even if you’re fastidious about washing your pillowcases. The grown-up experts at the Good Housekeeping Institute advise us that we should be washing our pillows every other month, and our duvets twice a year. But do you know how to wash your pillow without ending up with a lumpy bumpy mess on your hands? Before you start, check that you know what your pillow is made of as how you wash it will differ. Remove the pillowcase as well as the pillow protector (if there is one) and look for any holes in the actual pillow cover, in case the inside can escape. If you have holes, it’s probably best to cut your losses and buy a new one! The majority of these types of pillows can be washed in the washing machine, but always check the care instructions on the pillow first (look for the symbols on the label). Make sure that the drum on your washing machine is big enough to fit the pillow in and for it to move around during the cycle. Pillows which have feather fillings such as duck or goose can be washed in the washing machine, unlike the duvets which usually need to be professionally cleaned. Pillows made from memory foam cannot go in the washing machine. Either take them for professional cleaning or you can hand wash them yourself. You should also be able to use the upholstery attachment on your vacuum cleaner to get rid of any dust. Where can I wash my pillow? If you are using your washing machine, choose a gentle cycle for your pillows. Don’t be tempted to wash your pillow along with other items, as you risk transferring any colour or stains onto your pillow. 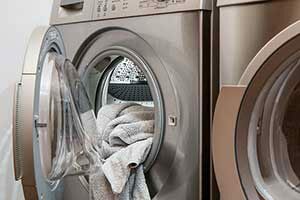 If your washing machine is big enough, you could wash two pillows together to give you a more balanced cycle. It can be beneficial to run an extra spin after the main wash cycle, so that you get rid of any excess water. Memory foam pillows are not suitable for washing machines but you can hand wash them at home (actual hand wash, not the hand wash cycle!). Use warm water mixed with your usual laundry detergent and ensure that the pillow is submerged. Gently massage the pillow to clean the surface. 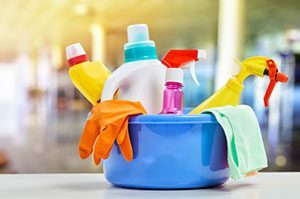 You will need to rinse it very thoroughly to get rid of the detergent. How do I dry my pillow after washing? 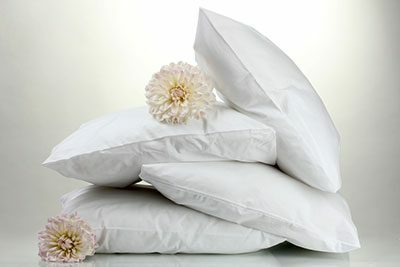 Once your pillow has been washed, give it a good shake out so that the filling gets distributed evenly. Again check the care label on your pillow if there is one. Lots of pillows can go in your tumble dryer but you do need to take care that they don’t go lumpy. You can try adding a couple of tennis balls to a pillowcase and chucking that in the dryer with the pillow. Pillows will absorb more water than your normal washing, so you’ll need to allow more time for drying. For all types of pillows, make sure that the cover and filling is completely dry. You risk mould or mildew if the filling is still damp, especially for natural fibres. Although pillows are not as expensive to replace as duvets or mattresses, once you find a good one you will want to sleep on it for as long as possible! Keeping your pillow clean and hygienic is actually very straightforward and doesn’t need a lot of time and effort. Alternatively, if your pillow is to far gone consider replacing it and starting afresh. Check out my top pillow recommendations if you need a hand deciding!